Rocco offers a stylish Mediterranean feel with plenty of greenery. 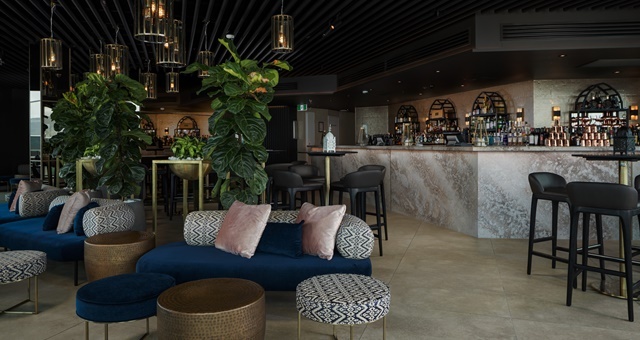 Pieces continue to fall into place at Riley – Crystalbrook Collection’s maiden five-star resort in Cairns – with the property this week opening the city’s first rooftop bar and restaurant. Titled ‘Rocco’, the dining outlet sits 12 storeys above the city and offers diners 270-degree views over the city and coastline. The bar has been designed in a Mediterranean style with a multitude of tropical plants and ceramics to put forth the ambience of a Greek or Spanish beachside venue. More than 40 whiskeys and 30 champagnes – including a mixture of vintage and non-vintage – make up the drinks menu at Rocco. Diners can also enjoy a menu comprised primarily of share plates and cocktails derived from locally-sourced ingredients. Highlights include herb and spiced vegetables, mezze plate with dips and toasted bread, grilled sumac calamari, falafels with jalapeno sauce and churro bites with chocolate dipping sauce. The restaurant concept was devised by SITE Hospitality, with C T R L_ leading the interior design process. “Earthy tones and Mediterranean prints create Rocco’s warm ambience while a tropical oasis of greenery welcomes guests the moment they arrive,” the property said.